Create the slot types, or parameter values, that the OrderPizza intent uses. In the left menu, choose the plus sign (+) next to Slot types. Value – Type thick. Press tab and in the Synonym field type stuffed. Choose the plus sign (+). Type thin and then choose the plus sign (+) again. Choose Add slot to intent. On the Intent page, choose Required. 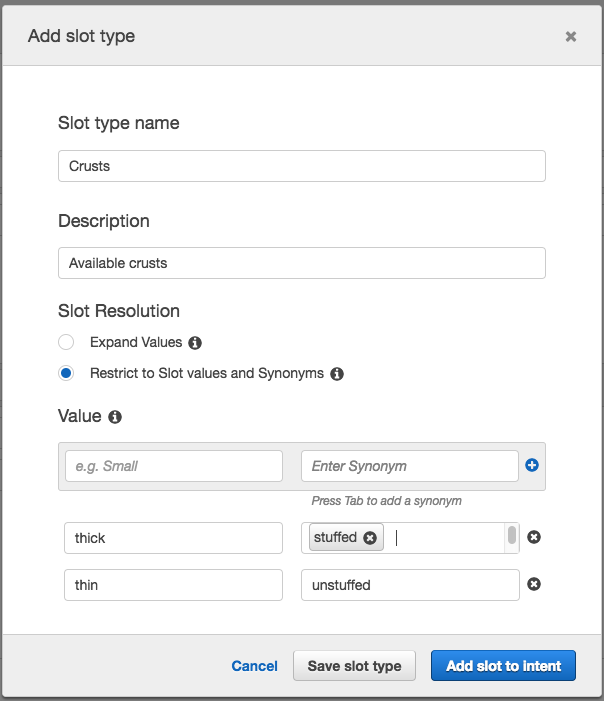 Change the name of the slot from slotOne to crust. Change the prompt to What kind of crust would you like? Sizes Available sizes small, medium, large size What size pizza? PizzaKind Available pizzas veg, cheese pizzaKind Do you want a veg or cheese pizza?